Strategic mergers and acquisitions have emerged as prominent moves for several technology vendors looking to strengthen their footprints in the global IT spending on clinical analytics market. Numerous prominent players have also been focusing on portfolio expansion, notably through co-marketing and acquisitions deals, in recent years. Some of the well-entrenched players in the global IT spending on clinical analytics market are Medical Information Technology, Inc., CareCloud Corporation, ArborMetrix, Inc., and McKesson Corporation. Non-traditional players who rose to prominence include names such as Oracle Financial Services Software Limited and IBM Corporation. The global IT spending on clinical analytics market will clock a CAGR of 12.3% 2016–2024. The market stood at US$11.650 bn in 2015, and by 2024 is projected to attain a global worth of more than US$32.420 bn. Among the various platforms, integrated clinical analytics solutions has attracted the highest IT spending vis-à-vis revenue in 2015. The segment will maintain the status quo in the global IT spending on clinical analytics market over next few years as well. Pressing need for better interoperability in healthcare analytics keeps the demand lucrative. Regionally, North America holds the sway and is expected to retain its dominance throughout the assessment period in the global IT spending on clinical analytics market. The regional market is likely to attain US$12,110 million by 2024. Sizeable IT spending on clinical analytics in the region is supported by robust healthcare infrastructures. Clinical analytics has generated groundswell of interest among healthcare enterprises in numerous countries for underpinning the rapid digital transformation in healthcare industry over the past few years. Rising interest has for many translated into huge technology spend. 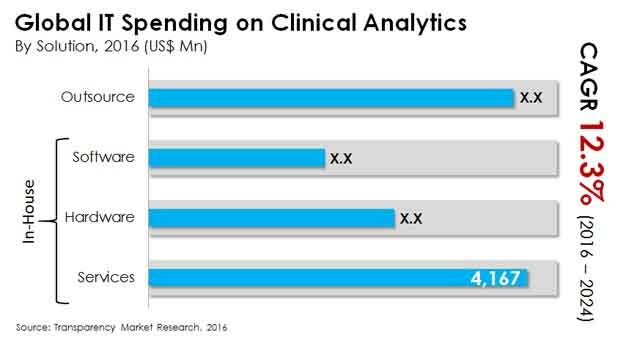 This is a key factor driving the global IT spending on clinical analytics market. Rapid digitization of health IT infrastructures in developed countries has accelerated spending on IT spending on clinical analytics. Growing adoption of healthcare enterprises of electronic health records (EHRs) in various regions across the globe is boosting the IT spending on clinical analytics. EHRs have shown promising potential in reducing medication errors, bring significant cost savings, and in improving population health. Healthcare providers have also been leveraging the potential of clinical analytics to lower hospital readmission rates. The shift of healthcare providers, payers, and insurers to support accountable patient care is boosting the IT spending on clinical analytics market. In this regard, personalized care has opened a world of possibilities for vendors, thereby reinforcing prospects of the IT spending on clinical analytics market. Despite the vast potential of clinical analytics, IT spending by healthcare executives has been modest in various regions. This can be attributed to the absence of a standardized framework for data in the IT spending on clinical analytics market. In emerging markets, this has made healthcare providers wary of the benefits and reliability of cloud, big data, and IoT in their IT infrastructures. Moreover, the lack of effective data security controls has taken the sheen out of the IT spending on clinical analytics market. Nonetheless, the global IT spending on clinical analytics market is likely to address several of these challenges in its strides. Recognition of substantial operational benefits of clinical analytics practices is a case in point. A growing number of vendors in the global IT spending on clinical analytics market are also proactive in address network security challenges. Such measures will pave way for lucrative avenues in the global IT spending on clinical analytics market. The study presented here is based on a report by Transparency Market Research (TMR) titled “IT Spending on Clinical Analytics Market (Platform - Stand-alone, Integrated; End User - Payer (Insurance Companies and Government) and Provider (Hospital and Clinics); Solution - In-house (Hardware, Software, and Services), and Outsource; Deployment - Cloud-based and On-premise) - Global Industry Analysis, Size, Share, Growth, Trends, and Forecast 2016–2024”.